The Pentax K-70 (Black) with HD Pentax DA 1:2.8 35mm Macro Limited. The K-70 builds over the K-S2, hence looks a lot like it. It improves over the K-S2 by incorporating some of the pro level features sound in flagship K-1 & K-3 II, while introducing others for the first time. Note: You can also find the comparison between K-70 and K-3 II and K-70 vs K-S2, published previously. 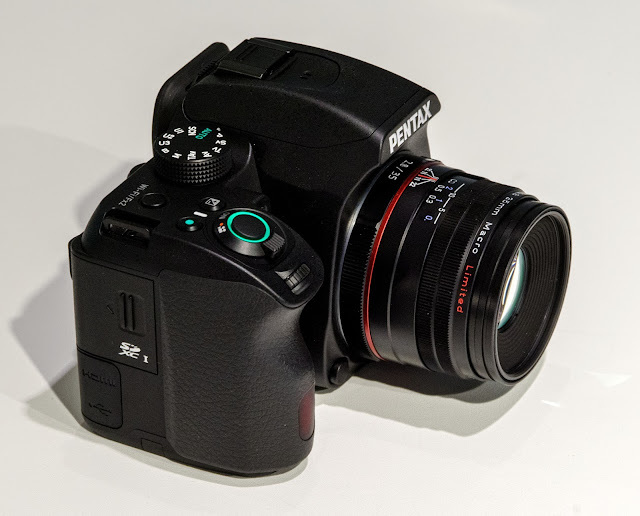 The Pentax K-70 from its name belongs to the upper entry level segment of DSLRs from Pentax, and is (from its nomenclature) a successor to the K-50 released in June 2013. Having said that, for me, the K-S2 released in February 2015 sits right between both of them when you consider the feature set and technology. The K-50 had a 16mp sensor with AA filter and a fixed screen. This was improved to 20mp without AA filter and a fully articulating screen in the K-S2. And now the K-70 has a brand new 24mp sensor with on sensor phase detect points, along with the same articulating screen from K-S2. 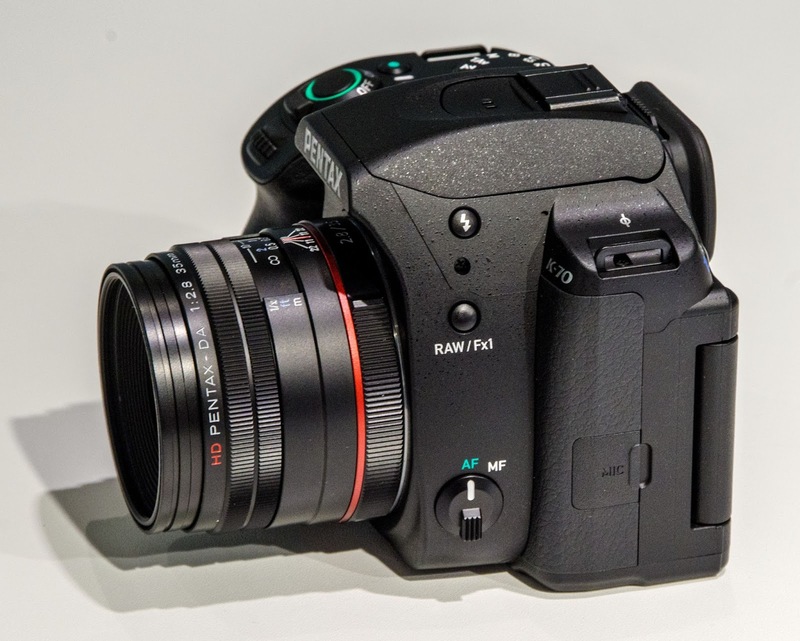 This also puts the K-70 in the same league of most other cameras from competing companies also using 24mp sensor - something which has become a de facto in the crop sensor market. 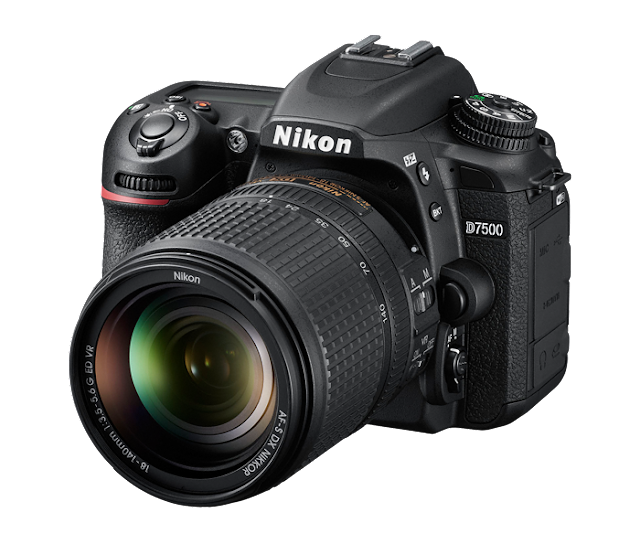 On the other hand, the D5500 is a natural successor to the D5300 and belongs to the Nikon's lineup of upper entry level DSLRs. It has a touch interface which promises intuitive and faster user interface along with touch to focus and a unique touch function capability. It also innovates in the field of ergonomics with a redesigned grip and in build quality with a monocoque structure, resulting in a lighter and slimmer body - something which is a strong point among mirrorless cameras. Both the K-70 and D5500 have 24 megapixel sensors without the Anti-aliasing filter. Both these sensors perform exceptionally well in high ISO, dynamic range and low light conditions. But from various comparisons, it seems the K-70 has a slight edge in color noise from ISO 6400 and above. The differences are seen more prominently from ISO 12800 and above. Having said that, one must not overemphasize the advantage since it's not that huge and the D5500 still is one of the best APSC sensors till date (it was my favorite till the k-S2 & then K-70 came along). It would be a mistake if you choose one over the other just on the basis of sensor performance. The K-70's on sensor phase detect autofocus points assist the contrast detect autofocus during live view. This should help eliminate focus hunting (a typical phenomenon among pure contrast detect AF systems) giving a smoother, faster and definite live view AF experience. Nikon lacks in this field and although live view focusing is fast in good day light with focus hunting being less prominent, it will hunt in low light and indoors. Having said that, the AF performance of K-70 in live view isn't different than that of K-S2 (which isn't that bad for a non hybrid AF system), this is because K-70 only uses those PDAF sensors in video mode. The reason I've mentioned this as an advantage is because it could easily be added with a firmware update. I can't help but think that disabling the hybrid AF is a marketing strategy, since this, on paper at least, would make the K-70's live view better than both the flagship APSC and Full frame. Twin Command Dials: K-70 has two dials, D5500 just one. Having 2 or more command dials is a feature that a camera company usually reserves for only its mid-range & high end offerings. Pentax isn't one of them! The advantage of having two command dials is that you can change 2 of the 3 exposure parameters on the fly in full manual mode. This is very handy in situations where time is critical while taking a shot and you can't afford the time spent in extra button presses. Also the functionality of the command dials (e-dials in Pentax literature) along with the green button is customizable for each exposure mode (P, Sv, Tv, Av, TAv, M, B). There is no such option for customizing in D5500 which makes sense when you have just one dial to play with. Having to change various settings for a different type of photography may take quite a bit of time and you may end up in missing the moment while you do it. e.g. 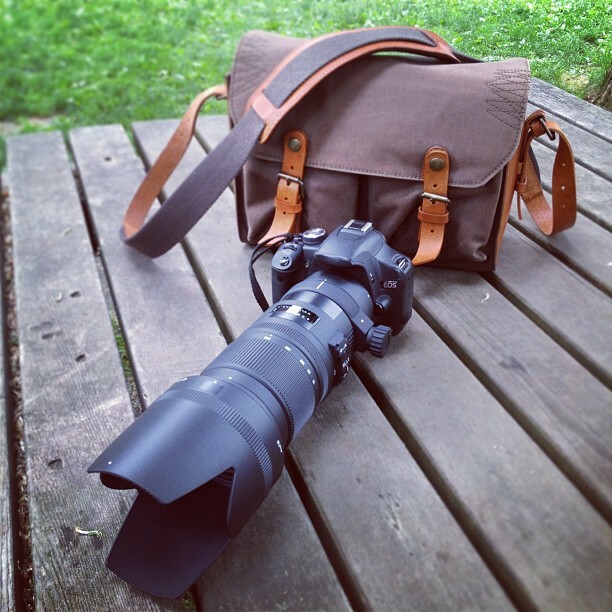 changing from stills to action may need you to change drive mode, AF selection, exposure mode & many more settings. How about presetting these into the camera's memory & accessing it via turn of mode dial!! The K-70 provides a generous set of 3 user modes which store lots of camera settings, all which change with a few turns of the mode dial. The D5500 has none, which is very disappointing. Top view of the Pentax K-70. Notice that the K-70 has 3 user modes - U1, U2 & U3. You can also see the Pentax exclusive modes - P (hyper Program), TAv, Sv. Also the green button is used to reset most settings to their default values. All these make the K-70 easy to customize & conveniently change advanced settings. Taking a light meter reading for accurate metering using manual aperture lenses. Hyper Program: When in program mode, you can control either aperture or shutter in program mode by turning appropriate e-dial while the other is automatically selected. 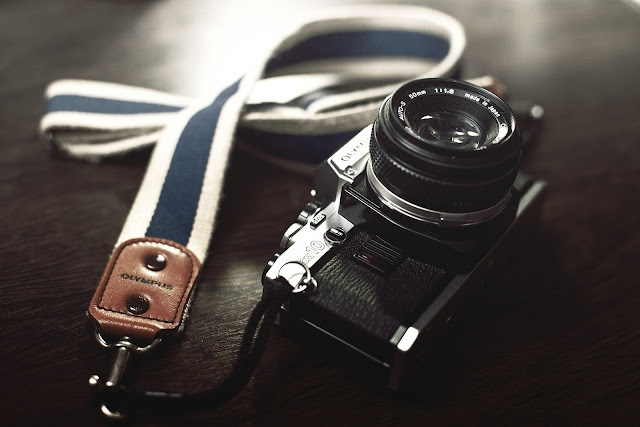 Sensitivity Value (Sv): In this exposure mode, you set the ISO value and aperture & shutter values are set automatically. Time & Aperture value (TAv): This is really the manual mode with auto ISO & is the opposite of Sv mode - set the aperture & shutter with e-dials while ISO is in auto. 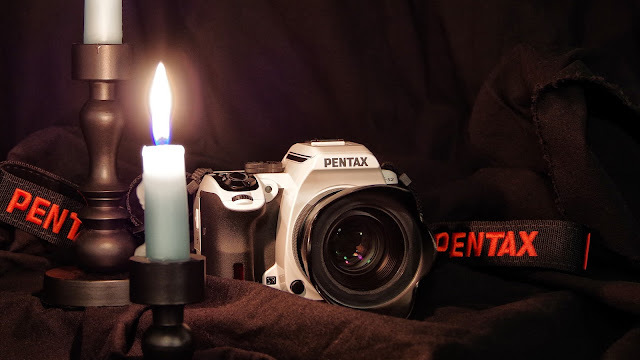 Pentax, in all its DSLRs employs sensor shift image stabilization (SR - shake reduction, in Pentax terminology) also called as in body image stabilization (IBIS), where the sensor itself shifts to compensate for shake. This contrasts with Nikon which uses optical image stabilization which uses a vibrating glass element inside the lens. You don't need to buy every lens which is optically stabilized when you have stabilization performed in body. Here you are saving on lens expenditure which is significantly more when it comes to stabilized lenses. Your favorite fast primes are automatically stabilized since fast prime lenses for portraits often don't come stabilized themselves. This makes Pentax a winner in low light/night portraits. With the absence of a stabilized element, you have one less elements for light to pass, so the lens aberrations are lesser. 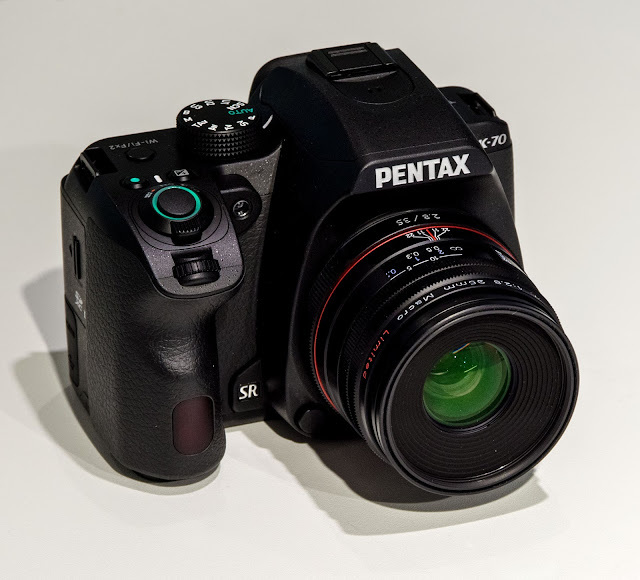 Here's another example where Pentax doesn't hesitate to include high end features in its entry level series. The K-70 has 100 weather seals around its body, protecting it from water, light rain, dust, humidity & temperatures as low as -10 degrees. With weather resistance you can afford to not worry if there is a bit of rain outdoors or if you are working in a dusty environment. 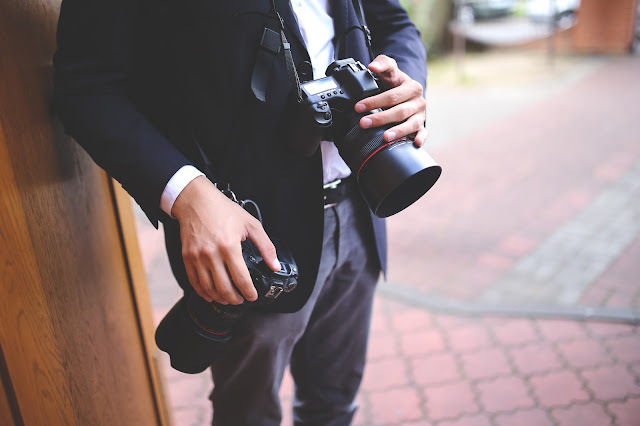 This makes photography possible without extra protective gear in adverse weather conditions which are often great for photography. Sealing also decreases the chances of camera failure overall since the camera is virtually isolated from external factors. The K-70 looks a lot more serious camera. It has a more uniform & monolithic look as compared to the K-S2 which had a lot nany patterns & colors over its body. Pentax uses a pentaprism glass for its optical viewfinders which are bright, provide almost 100% coverage of field of view seen by the sensor and has a 95% magnification. Nikon on the other hand reserves this luxury for its mid range and flagship models. 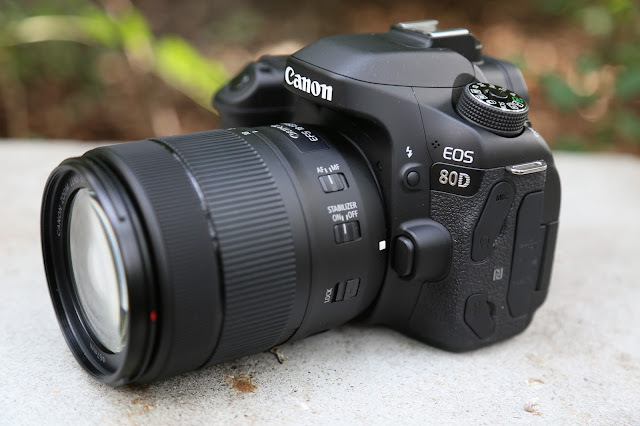 The D5500 has a dimmer pentamirror viewfinder with 95% coverage and just 82% magnification. The K-70 is a clear winner here. Pixel shift overcomes the inherent shortcoming of Bayer sensor by using sensor shift technology to vibrate the sensor at pixel level making each pixel in RAW file get color information from all neighboring 3 pixels along with the original pixel. The result is each pixel now has full color information. This visibly increases sharpness, noise performance and dynamic range; but needs the camera & subject both to be stable. 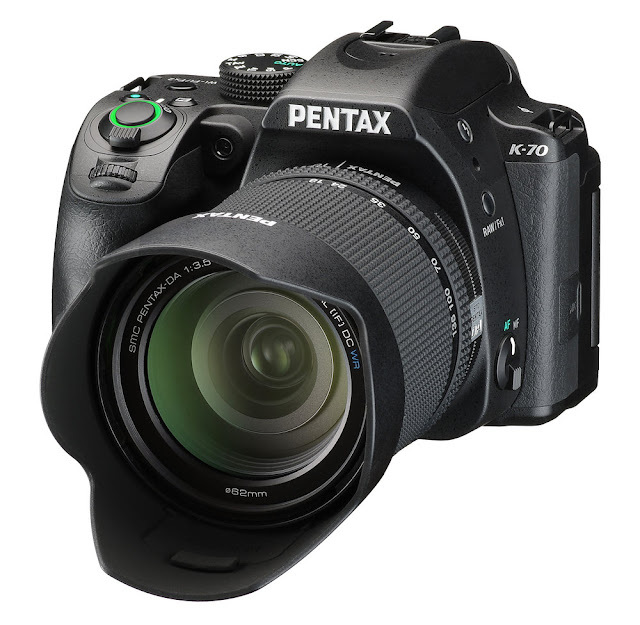 The K-70 is Pentax's first camera with on sensor phase detect points which work with the usual contrast detect AF to make makes autofocusing faster in live view (however Pentax claims that the K-70 only supports hybrid focusing in video mode) since it helps reduce focus hunting. The Nikon D5500 doesn't have this hardware, purely relies on contrast detect AF, so hunts more, even more so in low light. The K-70 has in body focus motor while D5500 skips it. 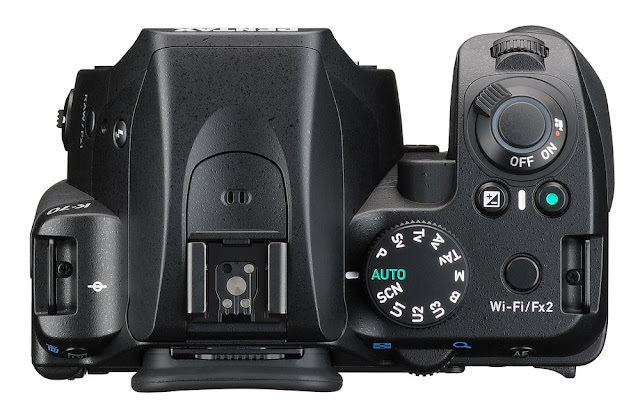 To have the in body focus motor, Nikon want you to upgrade to its mid range D7x00 series e.g. D7200. 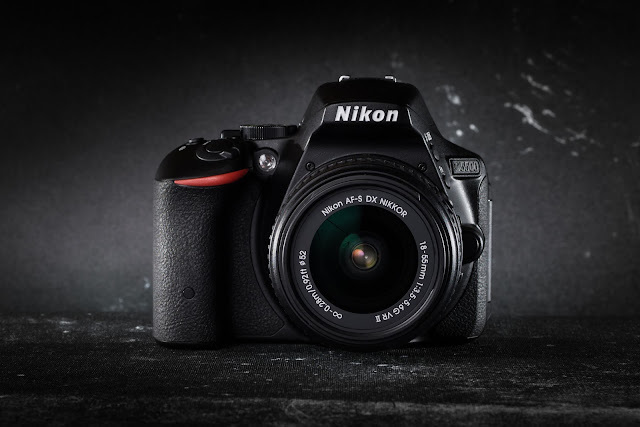 This means that with the D5500 you won't be able to focus with an older & inexpensive Nikon glass. This is not the case with Pentax, but this is not just for legacy lens support - many of Pentax's current lens lineup are screw driven and rely on an in body focus motor. It is a bit disappointing and ironic too, since the D5500 makes an excellent option from Nikon for someone who is on budget and won't mind a slower system (AF, burst, less buttons), but needs to upgrade to an expensive body to fully utilize cheaper, older lens options. The K-70 is the clear winner here with ~6 FPS while taking 14 bit RAW. On the other hand the D5500 manages 5 frames, but when limited to 12 bit readout. To have full 14 bit readout, it must slow down to 4 FPS. This will give the K-70 some edge over the D5500 in wildlife, bird & sports, but you need other factors like lens auto-focus, tracking and buffer depth to complement continuous burst. As mentioned above, just having higher burst speed doesn't help much if you don't have a large enough buffer to maintain it for a respectable time duration so the photographer gets enough time for a high probability for get a successful shot. In fact having higher burst will require larger buffer to maintain the speed for the given duration since it's filling up that much faster. The K-70 addresses this somewhat by accommodating for 11 RAW files or 9 RAW+JPEG (large) files before slowing down. The D5500 does 7 frames for RAW only while doing 5 FPS for RAW+JPEG (large). Both will sustain the high speed for just below 2 seconds for RAW only and around 1.5 seconds for RAW+, before slowing down. The shutter speed of K-70 edges out the D5500 by half a stop. 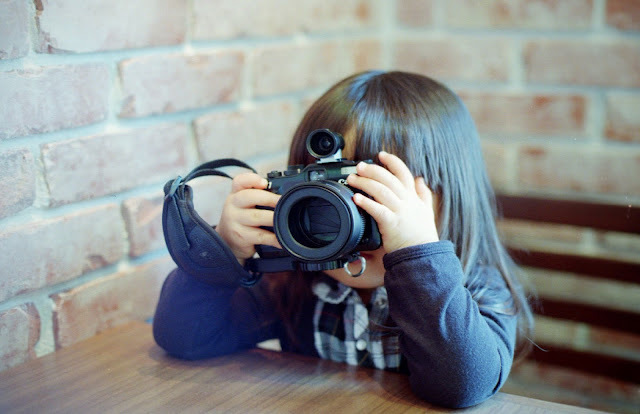 Although 1/2 stop isn't very significant, it could be of some use when freezing very fast action, or using a bright lens at its maximum aperture without using ND filters. When having multiple light sources, the scene is divided in multiple areas, each being applied with different white balance. Enhances the predominant color of the scene, e.g. a blue sky will look more blue, reddish sunset more red etc. White balance when using flash can be changed to auto, multi auto and unchanged from that of non flash. The D5500 has a separate white balance for flash (5400K) but not the type of customization found in K-70.